Top loading with no tools required for ease of use. Metal construction with silver finish ensures durabilty. Protective lenses keep dust and fingerprints off graphics. 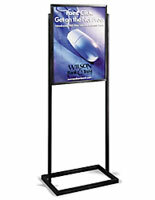 These sign display stands are a popular and effective means of posting advertisements and signage in a retail environment. Each of these fixtures is made with quality, sturdy metal with a silver finish. 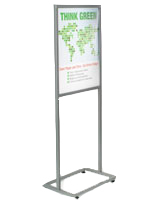 These sign display stands, also called signage holders, are lightweight and simple to relocate when needed. Place (2) 22" x 28" prints back-to-back against the middle support panel and then use the two non-glare lenses to protect the graphics. 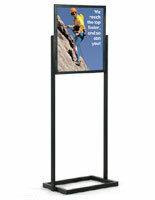 Each of these sign display stands features an open top that allows for quick and easy change outs. Simply slide the signage and lenses down into metal grooves of this rack. 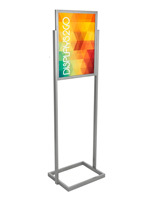 These sign display stands that have a simple design enable users to showcase two different prints back-to-back or the same print for multi-directional advertising. 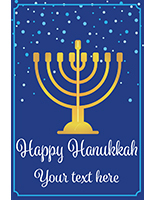 The large 22" x 28" frame size is commonly used in retail stores and other businesses. 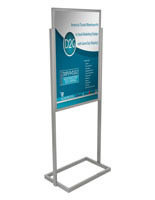 These sign display stands that are double-sided are over five feet tall, providing an ideal viewing angle. These signage holders ship unassembled to maintain low shipping charges and to avoid any damage during transit. Assembly of these sign display stands is simple and only requires a basic screwdriver to complete. All of the necessary hardware, screws, is included with each purchase. One person can put these sign display stands together in a matter of a few minutes. We also offer these fixtures in a black finish as well as various other frame sizes. 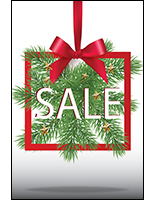 Buy these sign display stands today! This is made of great quality, easy to assemble and looks great! The product looks better in person and is great for promoting events and features. We'd love to see a photo of the stand in action, if you have one to share! 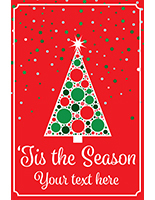 Thanks for shopping with us.